Page revised in December 2018. In the XVIIIth century travellers very often chose to come to Rome at Christmas. Their stay usually lasted for several weeks and while its initial part coincided with some of the most sumptuous religious ceremonies, its final one was devoted to more lay matters as the year end festivities were followed by the then celebrated Roman Carnival. 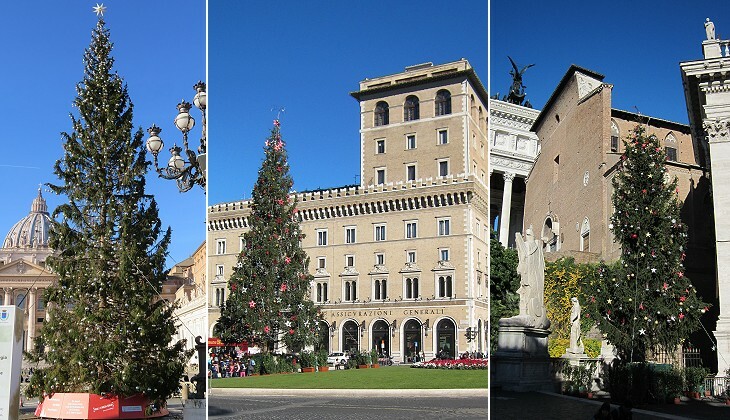 Every year a very tall Christmas tree is erected in Piazza S. Pietro: it is located near the obelisk and every year it is donated by a different country. Another tree is erected in Piazza Venezia, which is generally considered the very center of Rome; trees appear in some of the other historical squares. The dark green of the trees vainly fights to bring a feeling of cold winters and snowy landscapes. Marbles, travertine, palms, pines and a bright sunshine all conjure up a warmer Mediterranean atmosphere. One then understands why these trees do not belong to the Italian traditional way of celebrating Christmas. The first crib (It. 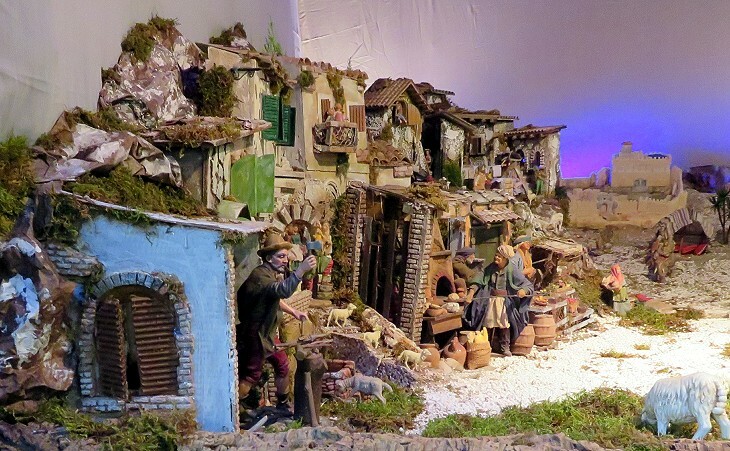 presepio) is thought to have been prepared by St. Francis in the 1223 Christmas' night in the monastery of Greccio, a very small town in Central Italy. The re-enactment of episodes of Jesus' life was not new as scenes of Christ's Passion were already part of the ceremonies of the Holy Week. Cribs became very popular and in the following centuries the manufacturing of the statues and of the landscape elements became a sort of minor art. 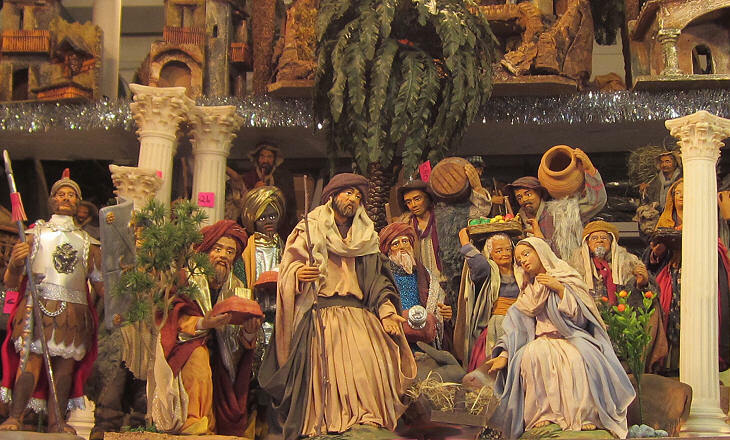 Most of the churches of Rome have very elaborate cribs which are displayed in the weeks before Christmas. To keep alive the tradition in less formal ways in some churches boy scouts are invited to build and display their own crib. 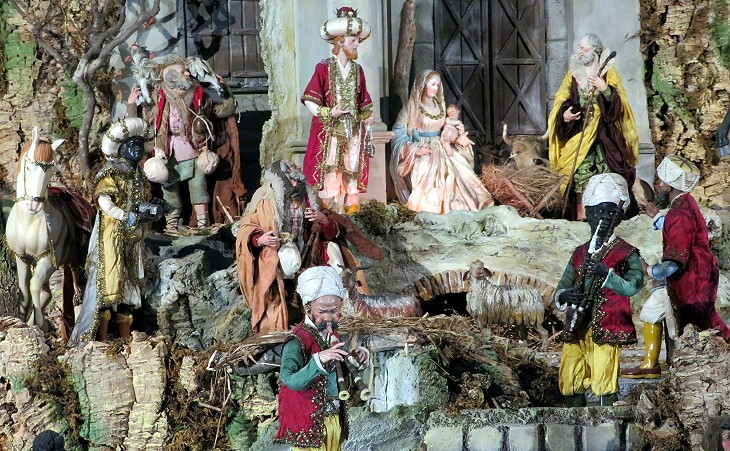 The crib changes during the festivity period: the Bambin Gesù (Infant Jesus) is added on Christmas' night and the three Magi make their appearance at the Epiphany (more on the Bambin Gesù of S. Maria in Aracoeli). Some churches prefer to display statues reminding of the Nativity, but not part of a formal crib. 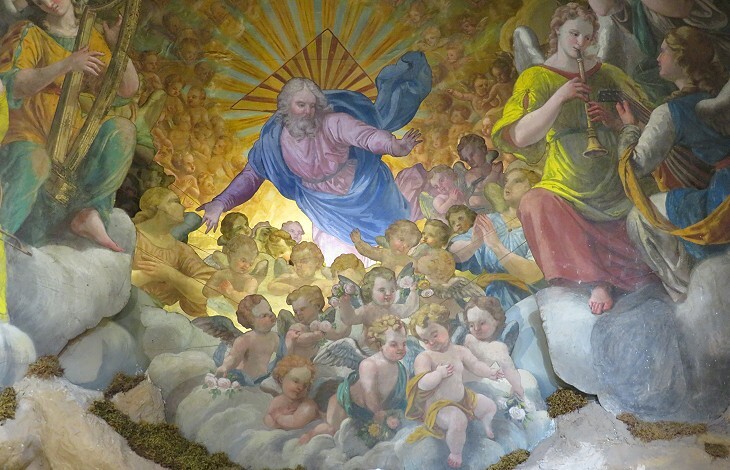 In the second half of the XVIIth century painters had developed advanced techniques for giving to the ceilings of churches the aspect of an open sky. These same skills were used for the most complex cribs. 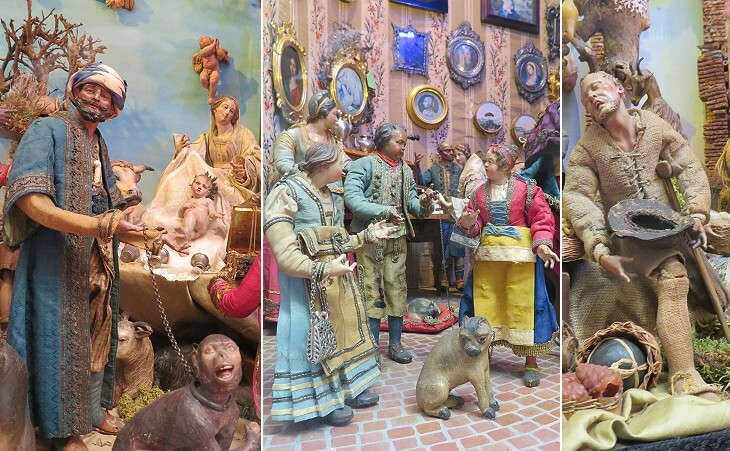 Naples became famous in the XVIIIth century for the development of very elaborate cribs using wood, cloth, terracotta and porcelain and introducing mechanisms to move figures around. 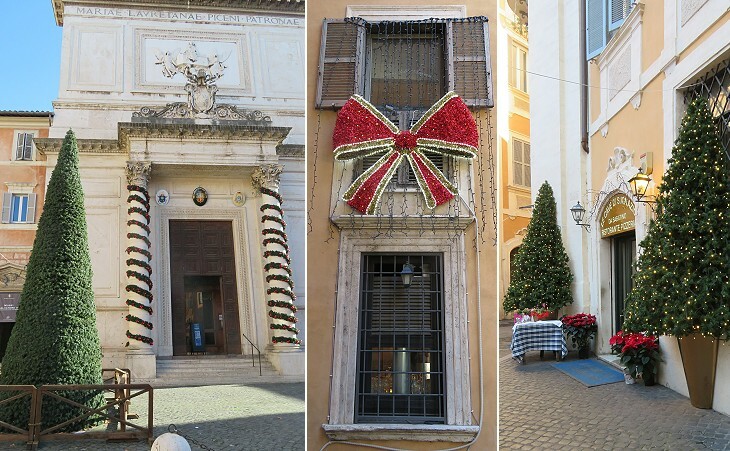 In Rome a perfect example of these cribs can be seen all year round in the cloister of SS. Cosma e Damiano. Today Neapolitan crib figures are sought after for elaborate and pretty expensive interior decoration. 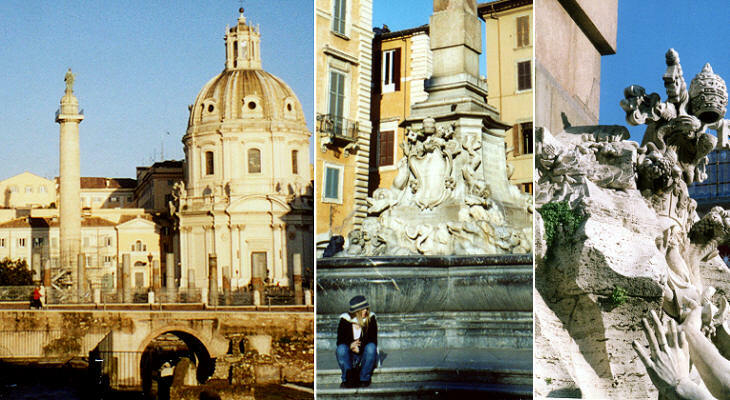 Every year a small fair is held in Piazza Navona to sell crib figures and toys for children. On the first Sunday after December 8, the feast of the Immaculate Conception, the Pope blesses in Piazza S. Pietro the bambinelli, the crib figures portraying the Infant Jesus. In the past, Italian children were given sweets and toys for the Epiphany in a re-enactment of the gifts brought to Jesus by the Magi: according to a popular tradition Befana, an old fairy having the aspect of a witch, fills the socks that children left near the fireplace with toys and sweets. Today in most families gifts including those to children are exchanged at Christmas, but still a sock of candies is usually given at the Epiphany. Naughty boys may find pieces of black coal instead, but they soon discover they are made of sugar. 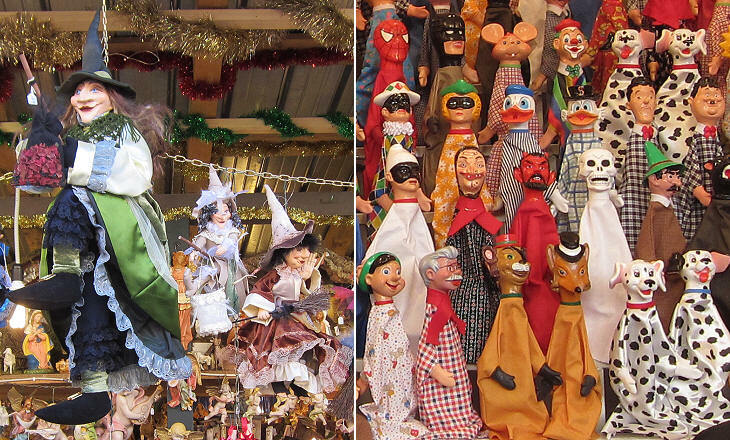 Until the 1950s a puppet theatre with the traditional characters of the Italian comedy was a toy very cherished by most boys and girls. Today the majority of the puppets actually sold portray TV and movie icons. Although some shopping districts in modern quarters of Rome decorate the streets at Christmas, it is fair to say that Rome does not offer a show of lights and decorations comparable to that of many other big cities. At Christmas the sun does not get high enough to allow taking pictures in the narrow streets of central Rome, but some photos in the archaeological areas get an additional interest from the long shadows projected by the monuments. In the first image above you can notice the shadow of Colonna Traiana projected on the buildings behind it. 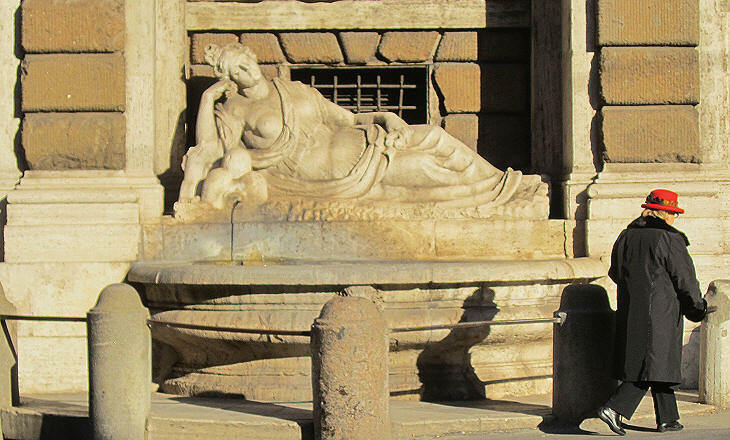 Early in the morning it may be necessary to wear a hat and a scarf, but during the day, the sunshine may raise the temperature to 15C/60F and it is hot enough for some spontaneous vegetation to put down roots next to the travertine flowers of Fontana dei Quattro Fiumi.